The Beats seem to be in fashion. A few years ago the Barber Institute here in Birmingham displayed the original manuscript of On the Road to great crowds. Last year we got Walter Salles’ dynamic and interesting take on Jack Kerouac’s On the Road, which deserved to be a greater success than it was. However, it seems that artists are more interested in these quests for personal, sexual and social freedom than audiences have been, as if the current reality is too harsh to nurture such romantic dreams. 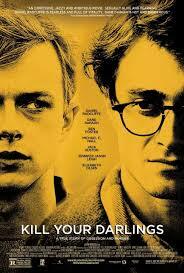 Kill Your Darlings is handsome fizzle that is not without interest. It has an arresting structure that begins with what one thinks is a scene of love and ends with what we will learn to see as an act of murder. Narratively, what’s led from one to the other? Thematically, what is the connection between the two? Extra-textually, it’s based on a real incident that connects to, and is meant to enlighten us on, the Beats. The film has an interesting story to tell — based on on real events and anchored in the Allan Ginsburg character played by Daniel Radcliffe — and an interesting project: to illuminate a structure of feeling in a culture of repression and dramatise its effects. Kill Your Darlings also has a brilliantly textured cinematography by Reed Morano; lovely early 40’s jazzy swing; imaginative editing that brings out values in a scene the direction seems to be unable to; a superb cast (Kyra Sedgwick, Jennifer Jason Leigh) with lead actors (Michael C. Hall, Daniel Radcliffe, Dane DeHaan) that are taking considerable risks, that fascinate but that ultimately can’t compensate for the flaws in the story’s telling. DeHaan, for example, always seems troubled, is often mesmeric but is rarely transparent: Jack Huston is terribly miscast as Kerouac. A complex film with a difficult subject and superb actors that is lovely to see and hear but doesn’t quite work. I’m nonetheless glad I saw it.